Westport (Irish: Cathair na Mart, meaning "stone fort of the beeves", historically anglicised as Cahernamart) is a town in County Mayo in Ireland. It is at the south-east corner of Clew Bay, an inlet of the Atlantic Ocean on the west coast of Ireland. The design for the town was commissioned in the 1780s by the John Browne of the nearby stately home, Westport House, as a place for his workers and tenants to live. John Browne cleared the original village of Cahernamart, that had 700 inhabitants, to make way for his gardens at Westport House. The current town centre was originally designed by James Wyatt in 1780, in the Georgian architectural style. Its layout follows the medieval principles of urban design introduced by the Normans in the 13th century. A particular feature is the incorporation of the river into the composition, contained for two blocks by low stone walls producing, on each side of the river, tree lined promenades (The Mall) with several stone bridges over the river Carrow Beg. The layout further includes several tree lined streets, addressed by the narrow fronted commercial buildings typical of Irish towns, though with many here remaining of a singular refinement and charm. Some modern interventions, such as the Garda station, are less successful in maintaining the original continuity of the urban fabric. The famous pilgrimage mountain of Croagh Patrick, known locally as "the Reek", lies some 10 km west of the town near the villages of Murrisk and Lecanvey. The mountain forms the backdrop to the town. Westport is a popular tourist destination and scores highly for Quality of Life. It has also won the Irish Tidy Towns Competition three times in 2001, 2006 and 2008; in 2012 it also won the Best Place to Live in Ireland competition run by The Irish Times. Westport originates and gets its name, in Irish, from a 16th-century castle--Cathair na Mart (meaning: The Stone Fort of the Beeves or The City of The Fairs)--and surrounding settlement, belonging to the powerful local seafaring Ó Máille Clan, who controlled the Clew Bay area, then known as Umaill. The original village of Cathair na Mart existed somewhere around what is now the front (East) lawn of Westport House. It had a high street, alleys down to the river and a population of around 700. A small port also existed at the mouth of the Carrowbeg river. Roads lead from the village to the west (West Road), the south (Sandy Hill Road) and the east (Old Paddock Road). The town was moved to its present site in the 1780s by the Browne family of Westport House to make way for their gardens and was renamed Westport. Westport is designated as a heritage town and is unusual in Ireland in that it is one of only a few planned towns in the country. The design of the town is attributed to James Wyatt, an English architect. He also completed Westport House, the stately home of the Marquess of Sligo and designed its dining room. Westport House had originally been built by Richard Cassels, the German architect, in the 1730s, near the site of the original Ó Máille Castle. The most notable feature of James Wyatt's town plan is the tree-lined boulevard, the Mall, built on the Carrowbeg River. Since the late 20th century, Westport has greatly expanded with several new estates. Some of the most populous estates are: Springfield, the Carrowbeg Estate, Horkans Hill, Cedar Park, Fairways, Knockranny Village and Sharkey Hill. Designed by the famous architects Richard Cassels and James Wyatt in the 18th century, Westport House is situated in a parkland setting with a lake, terraces, gardens and views overlooking Clew Bay, the Atlantic Ocean, Achill, Clare Island and Ireland's Holy Mountain, Croagh Patrick. In October 2015 it was revealed that the Westport House Estate was in the National Asset Management Agency (NAMA) for debts secured on the 380 acre estate, but not the house, for almost 10 million Euros. In January 2017, it was announced that a local family purchased the house and grounds. In 2007 the privately owned estate received a grant of 1.34 million Euros for repairs to Westport House, from the state funded Heritage Council. The previous owners, the Browne family, are direct descendants of wealthy slave plantation owners in Jamaica, Howe Peter Browne (2nd Marquess of Sligo) and his wife Lady Sligo (Hester Catherine De Burgh), as well the 16th-century pirate, Gráinne Ní Mháille, Queen of Umaill. An exhibition at Westport House styles Howe Peter Browne as 'Champion of the Slaves', a suggestion that one historian refers to as 'hyperbole' pointing out that: "Browne benefited from slavery from the cradle to the grave and did not free his slaves until the institution of slavery was abolished by an act of parliament" and that Howe Peter Browne also claimed, and received, substantial compensation from the British government for the loss of his slaves. The original House was built by Colonel John Browne, a Jacobite, who was at the Siege of Limerick, and his wife Maude Bourke. Maude Bourke was Ní Mháille’s great-great granddaughter. The House then did not have the lake or a dam and the tide rose and fell against the walls. Between the last two censuses (2006 and 2011) the town showed a limited growth from 5163 to 5543 inhabitants. People from Westport town are traditionally known as Coveys. Some decades ago the Covey dialect still existed and was unintelligible to outsiders. For example, the Covey word for a woman was a "doner". 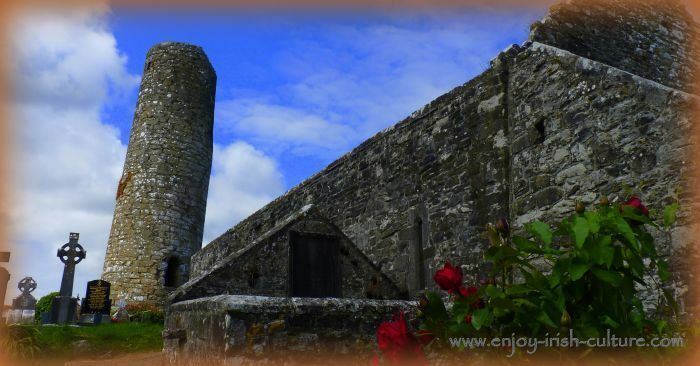 To this day inhabitants of nearby areas, including Castlebar, refer to the people of Westport, sometimes mildly disparagingly, sometimes somewhat affectionately, as Coveys. Matt Molloy of the Chieftains has a pub and music venue on Bridge Street. Many festivals and events are held in and around Westport each year. Westport has a regional newspaper based in the town, the Mayo News, founded in 1892. There are also copies of the Mayo Advertiser delivered door to door to houses in the area, as well as being available in many businesses around the town. Other local papers widely available are the Western People and the Connaught Telegraph. 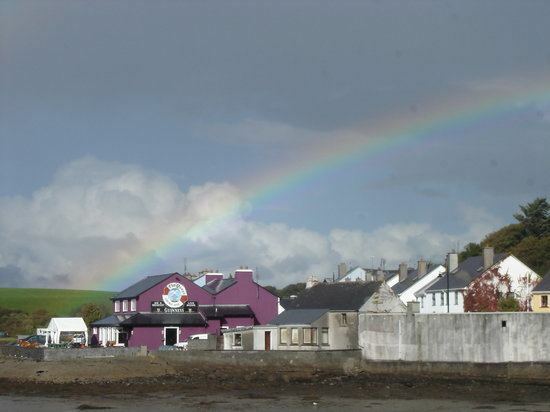 Westport is County Mayo's premier tourist destination, popular with holiday makers from all over the world and Ireland. "The most beautiful view I ever saw in the world. It forms an event in one's life to have seen that place so beautiful that is it, and so unlike other beauties that I know of. Were such beauties lying on English shores it would be a world's wonder perhaps, if it were on the Mediterranean or Baltic, English travellers would flock to it by hundreds, why not come and see it in Ireland!" Visitors visit Westport for several reasons: the scenery; the pubs and restaurants in the town; blue flag beaches; and Croagh Patrick. 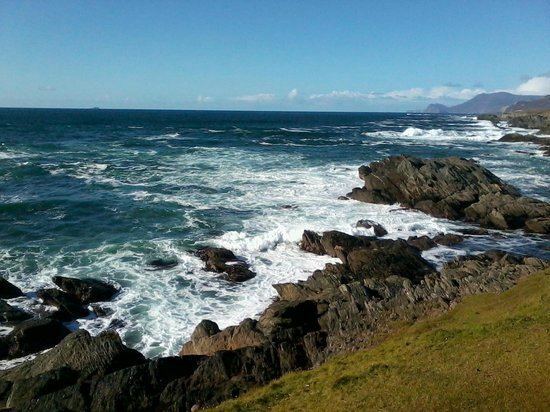 Its proximity to Connemara, Achill, Clew Bay and Croagh Patrick, and its hotels and guest houses, make it a base for holidaymakers to tour the region. Westport House and its Pirate Adventure Park attracts families. Westport has an 18-hole golf course and nearby a 9-hole course. In January 2008, Westport became Google Earth's first fully 3D town. Westport is twinned with Plougastel-Daoulas in Brittany, France and with Limavady, County Londonderry, Northern Ireland. Link with the latter have their roots in the 1980s and the official ratification and twinning ceremony took place in 2002. Westport also has a partnership with the town of Aror, Kenya, and the people of Westport have contributed to improving the infrastructure of Aror. There are four churches in the town: the Catholic Church, St Mary's; the Anglican church, Holy Trinity; the Evangelical church, Calvary Church Westport; the Elim Pentecostal Church, Amazing Grace Church . Historically, a Methodist church existed on the Mall and a Presbyterian church on Distillery Road. Church records for the 19th century for the Westport area (Church of Ireland, Methodist, Roman Catholic, civil, gravestone inscriptions, etc.) and other historical records are held at the South Mayo Family Research Centre in Ballinrobe and The Clew Bay Heritage Centre at Westport Quay. The educational facilities in Westport have, for many years been associated with the Congregation of Christian Brothers. The first of these facilities was established in Castlebar Street in 1865 before transferring to the Newport road in 1962 where the former national school can still be seen today. In 1987 the secondary school, Rice College was built on the Castlebar Road in order to cater for the increasing educational requirements. The town is the terminus of a 250 km Dublin-Westport/Galway railway line from Dublin Heuston in Dublin. This railway connects the town to Castlebar. Westport railway station opened on 28 January 1866. The line originally ran through to Westport Quay station (opened on 1 January 1875 and closed in April 1977). This line was lifted overnight in 1977 by Córas Iompair Éireann (CIÉ). In order to pacify local concern, the bulk of the trackbed of this extension was converted to a public walkway, still open today. There was also a branch to Achill Island branching off after the station, but this closed in 1937. The Great Western Greenway is a greenway rail trail that follows the route of the former Midland Great Western Railway branch line to Achill, via Newport and Mulranny. The N5 national primary route also connects the town to Castlebar, as well as connecting to the N4 near Longford that leads onward to Dublin. The other major road passing through Westport is the N59 national secondary route. The regional airport is Ireland West Airport Knock, 60 km (37 mi) away. A monument stands on the Mall in memory of Major John MacBride. Born locally in 1865, he joined the Boer army which fought the British in the Second Boer War, rising to the rank of major. He was executed in 1916 for his part in the Easter Rising. He was the father of Sean MacBride, the Nobel peace laureate. Cornelius Coughlan who won the Victoria Cross in the service of the British Army is buried locally. Irish writer George A. Birmingham (real name James Hannay) was the Protestant rector in Westport for a number of years. He infamously caused a riot in the town when his successful play General John Regan was staged there and the locals began recognising, to their disdain, that the characters were based on themselves. Westport has a small adjoining port, the Quay, once busy but no longer used for commercial shipping, now a suburb notable for its many warehouse conversions. The quay is also known for its restaurants and pubs. It also includes the training ground of Westport United. The Clew Bay Heritage Centre, a small museum celebrating the history of Westport and maritime history of Clew Bay, is open to the public here. In 1894, the harbour was the scene of the Clew Bay Drowning. The Gaelic football club, Westport United soccer club and the Rugby club have a venerable tradition in both county and national competition. Westport, and the surrounding region, has been identified as a primary centre for adventure sports by Fáilte Ireland. In August it annually hosts the largest one-day adventure multi-sport race of its kind in the World – Gael Force West. It is also home to horse riding; surfing; sea kayaking; wind surfing and sailing schools and other adventure sports. Westport is an angling centre providing sea fishing on Clew Bay and game and coarse fishing on nearby loughs and rivers. Clew Bay itself is a sea angling centre hosting many sea fishing competitions each year and it is known as a venue for common skate fishing in the country and holds the Irish record for a 160 lb white skate. It is also considered one of the best venues for tope, huss and ray. The Westport GAA club, CLG Chathair na Mart, have a history going back to the nineteenth century. Gaelic football is the main sport played within the club. Westport Golf Club (championship) was in 2009 ranked 43rd out of the top 100 golf courses in Ireland by Golf Digest. It has hosted a number of tournaments, both the Ladies Home Internationals in 1989 and the Irish Amateur Close Championship on three occasions, last time in 1997. It also hosted the Irish PGA Championship in 2002. Westport United football club was founded in 1911. Westport United won the FAI Junior Cup in 2005 in Kilkenny and play their home matches in the Sports Park. The club colours are red and black. Westport also won the Connaught Cup in 1942, 1945, 1949, 1961, 1974, 1987 and 2012 along with numerous Mayo titles. Westport Rugby Club, are located in Carrowholly a few kilometres outside the town. League and Cawley cup champions in 2016 and junior cup champions in 2015,. The Mayo Sailing Club is located a few kilometres out of town in Rosmoney.